Goals are important, if you want to be successful. But why, exactly? Today, we'll look at 7 benefits to goal setting. We'll discuss two types of goals and how they can most benefit you in your journey becoming a successful poker player. Setting goals to improve performance is not a new idea. It’s one that has been used by elite performers of all types since ancient times. Furthermore, the non-elite can benefit from setting goals, too. I’ve spent a lot of time studying the question of whether or not setting goals makes sense for poker players, and I think that it does. Longtime psychology professor and author Ed Locke is America’s foremost expert on goal setting. Locke defines a goal as “what a person wants to accomplish; it is the object or aim of an action.” We have all set goals for ourselves with this definition in mind. Of course, some goals we’ve set are more effective than others, but we’ll get more into that in a bit. For now, let’s consider some of the benefits of setting goals. On balance, there are many good reasons to set goals. Yet many poker players I’ve talked to about this topic think that goal setting doesn’t actually work for poker. I disagree! Rather, I think that setting the right kinds of goals is the most important factor for poker players to understand, and can make goal setting especially beneficial. There are several types of goals one can set. The type with which most people are familiar is known as outcome goals. An outcome goal is your overall objective with regard to outperforming other competitors. For example, if you want to win a major title, that’s an outcome goal. It is your ultimate destination. This is a fine goal to have, but it should not be the focus of your daily activities. Instead, you need to think about process goals. Process goals focus on improving your knowledge, techniques, and strategies and are directly under your control. Think about what it takes to win a major poker title, for example. Yes, you must play well, but there are many factors that are outside of your control. You cannot control your opponents’ decisions, nor can you control the luck element. But you can control the amount of study time your put in on a daily basis. Your process goals should focus on the actions you can take to improve your overall performance. Once your overall performance improves, the achievement of your outcome goal becomes more likely. Having an outcome goal without an action plan — that is, without process goals — will typically lead to a poor performance. As you can see, process goals are very specific and within your control. There is no luck element. Either you did your daily task or you didn’t — the target is clear with each, and you can ensure you hit that target. By sticking to your process goals, you will increase your knowledge and ability. There is no way around it! Another way to set process goals is to consider problem areas. Perhaps you don’t respond well to three-bets when you are out of position or your blind play is weak. You can come up with a set of process goals that addresses your problem areas. Set an action plan to overcome problems and issues. Your process goals might include watching videos that pertain to your problem area, consulting a coach, or spending time working out the math behind the issue. Whatever you choose, make sure that you practice your new approach until you feel you have mastered the problem. 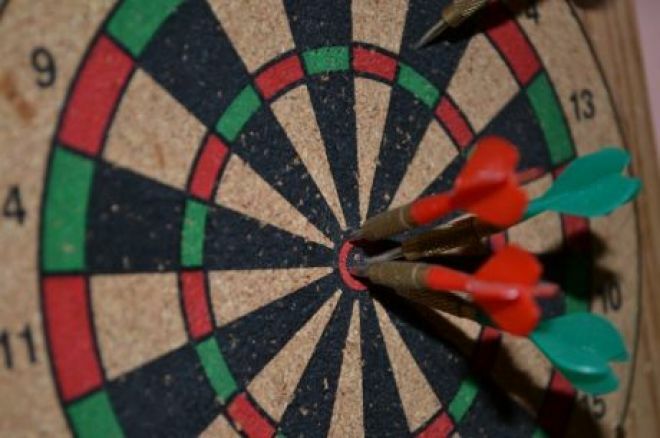 Goal setting is the most commonly used performance enhancement strategy in the sports world, and there is no reason why some of the same principles can’t be used for poker players looking to enhance their play. Just remember when setting your goals that the journey (the process) is more important than the destination (or outcome). Clinical evidence is overwhelming in favor of setting process goals that lead to the eventual outcome that you desire, so make the majority of your goals process ones and you’ll be well on your way! Photo: “Darts,” Richard Matthews. Creative Commons Attribution ShareAlike 2.0 Generic.